Meter Wire Binding 23 Ring Supplies are designed for use with any 2:1 Pitch Wire Binding Machine and give a professional touch to your reports, submissions and presentations. 2:1 Pitch 23 Ring Wire Binding Coils are used for larger size documents that are above 120 pages in size. While 3:1 Pitch 34 Ring Wire Binding Coils are used for smaller documents that are under 120 pages. 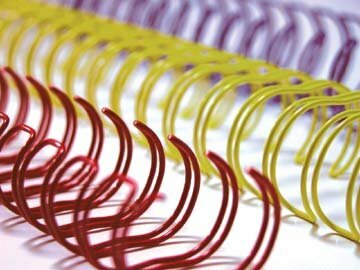 As Wire Binding Combs come in various pitches or types it is important to make sure you are ordering the correct type of Wire for your Binding Machine. Wire Binding Supplies that are referred to as either 2:1 Pitch or 23 Ring are effectively describing the same thing. The 23 Ring denotes the number of holes that are punched on the long side of a sheet of A4 paper i.e. 23 holes. The 2:1 Pitch means that for every inch of paper there are 2 holes punched. Wire Binding Coils 23 Ring are also known as Twin Loop Wire Binding or Wiro Binding Combs, and provide a strong and permanent way to bind documents. When books are bound with 2:1 pitch wire they lay fully flat when opened and pages can be completely reversed 360 degrees. This assists the user if the document needs to be photocopied or scanned. Robust even under intensive use, Wire Bind documents last longer and the spines won’t become brittle with age. 23 Ring Wire Binding also provides extra security as pages cannot easily be added or removed from the document without destroying it. Available in a Black and White colour, Wire Binding Coils 23 Ring bind from 120 to 270 pages with six different sizes of wire to choose from. Wire Binding Coils 23 Ring 2:1 Pitch give your presentations a Professional Image. 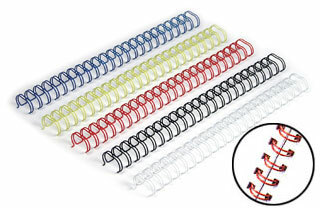 Click on the links below for pricing and more information on different Wire Binding Supplies 23 Ring sizes and colours.